With the increasing count of new hotels, restaurants, cafes across the world, thanks to the swift expansion of the worldwide tourism industry, the global market for HVAC and Refrigeration (HVACR) systems is likely to witness a sturdy rise in its valuation over the forthcoming years. Apart from this, the increasing implementation of norms and rules for the regulation of food safety and quality is also expecting to boost the adoptions of HVACR systems in the near future. The opportunity in the global HVACR systems market is likely to increase at a CAGR of 5.50% during the period from 2016 to 2020, rising from US$81.1 bn in 2015 to a value of US$130.7 bn by the end of the forecast period. In terms of volume, the market is estimated to expand at a CAGR of 8.0% during the same forecast period, supported by the increasing demand for refrigeration equipment in cold storage and food processing end users, owing to the rising consumption of processed food and beverages. Condensing units, package systems, unit coolers, control devices, evaporators, chillers, cabinet counters, fan coils, display cases, compressor racks, walk-in cooling units, and HVAC air handling units are the main type of products available in the global market for HVACR systems. Among these, the evaporators segment has surfaced as the most valued product. In 2015, the segment accounted for a share of nearly 26% in the overall revenue generated in the global market. Researchers predict the demand for evaporators to continue to rise, ensuring the dominance of this segment during the forecast period. However, the segment of display cases is likely to exhibit the most prominent growth rate in the coming years, thanks to the technological advancements in display cases, the cost benefits they offer, and their escalating demand in supermarkets across the world. On the basis of geography, the global market for HVACR systems stretches across North America, South America, the Middle East and Africa, Europe, and Asia Pacific. Asia Pacific, of these, has emerged as the key contributor to the demand for HVACR systems on account of the robust tourism industry. The regional market is also projected to continue its leading steak over the forecast period. India, China, Japan, South Korea, and Australia are anticipated lead the market for HVACR systems in Asia Pacific in the years to come. The global HVACR systems market demonstrates a highly fragmented landscape with only a few companies being able to establish themselves as market leaders. At the forefront of this market are Lennox International Inc., Zero Zone Inc., Epta S.p.A., Hussmann International Inc., Dover Corp., Beverage-Air Corp., GEA Group, Larsen & Toubro, Foster GE, Airtex Compressors, Frank technologies, The Midea Group, Carrier Corp., Haier Electronics Group Co. Ltd., Mitsubishi Corp., and Daikin Industries Ltd. This report aims to provide a comprehensive strategic analysis of the global HVAC and refrigeration systems market along with revenue, volume and growth forecasts for the period from 2014 to 2024. With product innovation in HVAC and refrigeration systems with deployment of smart technology and rising demand for HVAC and refrigeration systems in food service and food processing end-use, the HVAC and refrigeration systems market is expected to experience high growth in the coming decade. Some of the factors supporting the growth of the market worldwide include the emergence of supermarket subsequently increasing the demand for HVAC systems and increased cold storage industry in developing regions such as Asia Pacific, increasing food safety and quality regulations, advent of industry specific HVAC and refrigeration systems in developed regions such as North America and Europe, increasing awareness of natural refrigerant, and surge in demand for HVAC and refrigeration systems integrated with smart technology technology. The impact of these and other macro-micro economic factors has been analyzed while developing the market growth models. This research study on the global HVAC and refrigeration systems market provides a detailed analysis of various HVAC and refrigeration equipment across various end-use depending upon their needs. Moreover, the research study also analyses market analysis for global refrigerant market. The report offers an in-depth study of the market drivers, restraints, and growth opportunities. Using these factors, the study identifies various trends prominent in the industry and are expected to influence the market growth during the forecast period from 2016 to 2024. It includes a comprehensive coverage of the underlying economic and technological factors influencing the HVAC and refrigeration systems market growth. It provides the competitive landscape of key players in the HVAC and refrigeration systems market in order to highlight the state of competition therein. The report also provides a detailed competitive analysis of the key players in the market and identifies various business strategies adopted by them. The study explains the penetration within each market segment across various geographies, and how these segments have accelerated the growth of the market as a whole. 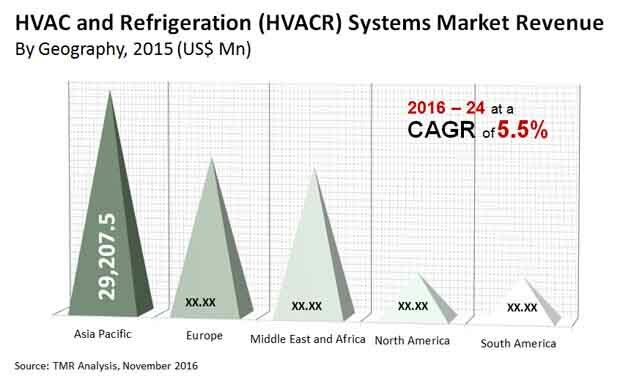 The global HVAC and refrigeration systems market is analyzed by segmenting it on the basis of equipment type and end-use. Based on equipment type, the market is classified into condensing units, unit coolers, package systems, control devices, HVAC air handling unit, chillers, evaporator, display cases, fan coil, compressor racks, cabinet counter, and walk-in cooling unit. In terms of end-use, the global HVAC and refrigeration systems market is segmented into food service, food processing, supermarket, cold storage, and others. The report also includes global refrigerant market by type such as fluorocarbons, inorganic and hydrocarbons. Geographically, the global market for HVAC and refrigeration systems has been segmented into five regions: North America, Europe, Asia Pacific, Middle East and Africa (MEA), and South America. The market size and forecast for each region has been provided for the period from 2014 to 2024 along with the CAGR (%) for the forecast period from 2016 to 2024. The study also includes quantitative analysis of the competitive scenario for major countries/regions such as The U.S., Canada, France, Spain, Portugal, Italy, Benelux, Germany, U.K., Nordic countries Central Europe (excl. Poland), Poland, Russia, China, Singapore, Thailand, Hong Kong, Vietnam Malaysia, Australia, UAE, Saudi Arabia, South Africa, Brazil, Columbia, Argentina, Chile, Venezuela, and Peru in respective regional outlook. The analysis by equipment, end-use, refrigerant and regions helps in evaluating the present scenario and growth prospects of the HVAC and refrigeration systems market over the forecast period from 2016 to 2024. The report concludes with the profiles of major players in the HVAC and refrigeration systems market on the basis of various attributes, such as company overview, financial overview, business strategies, SWOT analysis, segment presence, and recent developments. The major players profiled in this report with significant development in line with HVAC and refrigeration system market include Daikin Industries Ltd., Mitsubishi Corporation, Haier Electronics Group Co., Ltd., Carrier Corporation, The Midea Group, Frank technologies, Airtex Compressors, Foster GE, Larsen & Toubro, GEA Group, Beverage-Air Corporation, Dover Corporation, Hussmann International, Inc., Epta S.p.A., Zero Zone Inc. and Lennox International, Inc.